I think I have found my all time favorite low carb, low calorie lunch! 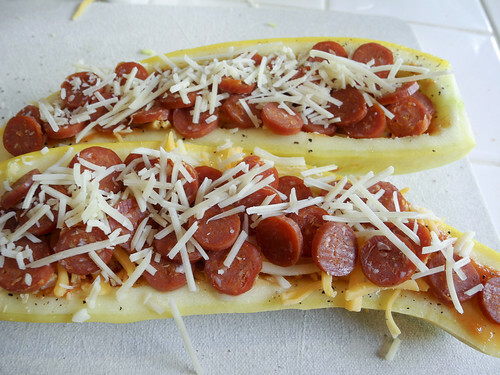 These Zucchini Pizza Boats are amazing and very low calorie, I’ve double checked them twice!! 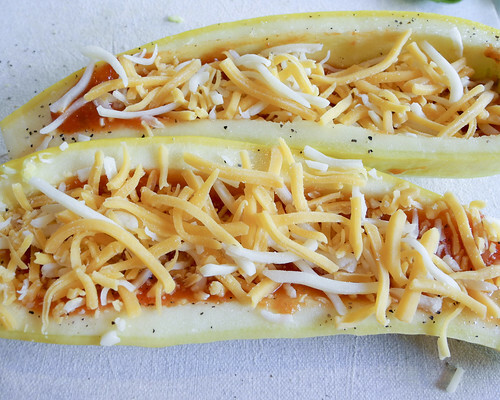 Can you believe these Zucchini Pizza boats are only 110 calories per piece! 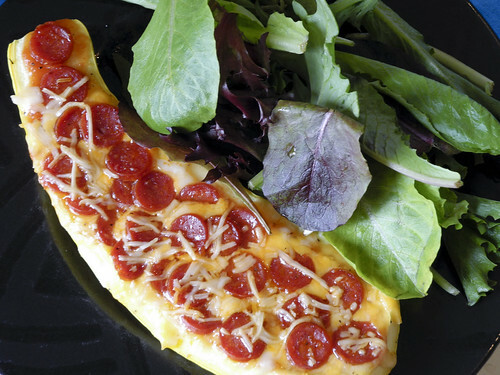 You can actually have both sides for lunch and still have a side salad and stay underneath 300 calories! 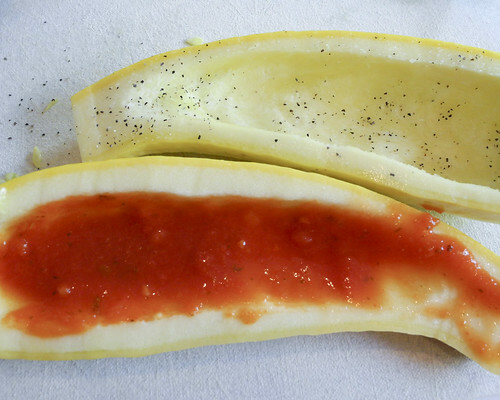 To add a little flavor sprinkle the zucchini with salt and pepper and then spread spaghetti sauce in boats. I’ve also used tomato sauce and sprinkled it with italian seasoning. I do recommend that you make sure there is no corn syrup in your tomato sauce. When using cheese make sure that you measure carefully. Cheese is a calorie dense ingredient, but also very yummy! To get a little more punch from your cheese make sure you grab a sharp cheddar or pepper jack. The more flavor to the cheese the less you will need to feel satisfied. 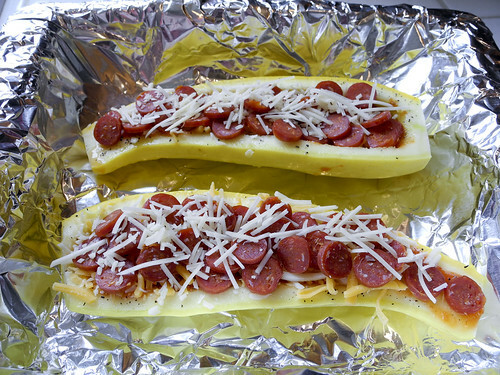 As you can see I’ve made the Zucchini Pizza Boat recipe with regular turkey pepperoni and mini turkey pepperoni. I love the mini turkey pepperonis but they can be hard to find sometimes. To add a little more flavor I sprinkle parmesan cheese over the pepperoni. You could reserve a little of the regular cheese if you would prefer. This recipe is incredibly easy and ready in only 20 minutes! 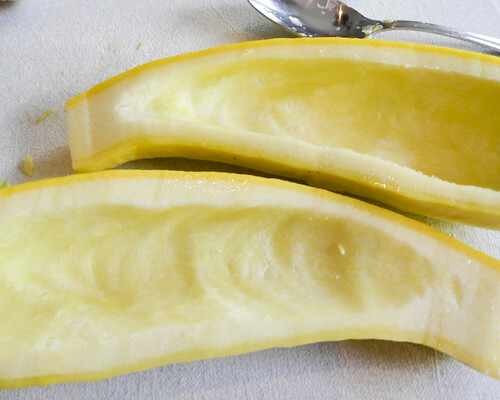 Cook for 20 minutes – watch your zucchini pizza boats carefully as the size of zucchini can change the cooking time. Follow Pepper Ferguson’s board Holidays – Be My Valentine on Pinterest. I’m not a huge fan of zucchini normally, generally finding it too sloppy. But without the seeds – mmm, that might taste quite different. I don’t eat meat though – maybe it would work with tuna and cheese? I’ve been wanting to make zucchini pizza boats for the longest time and for some reason I never got around to it (silly silly me). This is one nice food to include in the daily menu. It has less calories yet it still offers a very nice experience for our taste buds. Oh wow Pepper. That looks fantastic! I did something similar but cut the squash into circle rounds and did the same thing… this looks much easier!! 🙂 You have the greatest ideas. 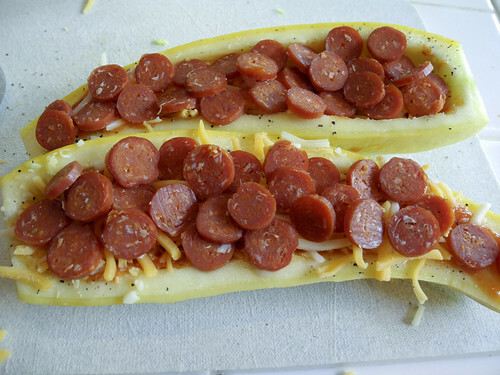 Do you think this would be good for school lunch? Is it good when it’s not totally hot?